Conference tournaments begin this week and for the first time, I will spend time predicting each conference tournament game to be played! I won’t go too deep into explanation for some tournaments as I’ve never seen some of the teams play. Generally in earlier tournaments, I will generally pick the favorite (higher seeded team) to win. I love the Ohio Valley Conference tournament because it’s four straight days that begin with 4 teams vying to play the next day. Every game is played at the Ford Center in Evansville, Indiana. With two weeks remaining before the NCAA tournament bracket is released, the Big East still remains up for grabs and there is a logjam in the middle of the conference with seeding up for grabs for the Big East tournament. The tournament begins Wednesday, March 7th and concludes Saturday, March 10th. A couple observations to consider regarding every team entering the conference tournament are a team’s offensive and defensive efficiencies. The Big East does not possess an overall strong defense. 7 of the 10 Big East teams are outside the top 50 in defensive efficiency in Kenpom’s ratings. That’s not a good sign if a team wishes to make the Final Four or Championship game. However, the deficiency in defense for the conference as a whole has not been much of a problem because of how highly efficient the offenses are. 6 Big East teams rank in the top 25 in Kenpom’s ratings. This helps explain the trends seen this year during conference play, with high scoring games. Here’s a quick look around the conference and possible outcomes of seeding for the tournament. Xavier 25-4 (13-3) The Musketeers have arguably the easiest close to the regular season which means they are close to locking up their first Big East title. As conferences gear up for the post season, teams refocus and look to string some wins together in the hopes of reserving a spot in the field of 68. The Musketeers have no problems with offense, yet they rank 72nd in defensive efficiency according the kenpom. Villanova 26-3 (12-4) Another road loss, this time at Creighton, has likely relegated the Wildcats to a second seed going into the Big East Tournament. For the first time in the new look Big East, Villanova will be seeded something other than 1. Second is nothing to be concerned about as the Wildcats continue to produce and compete at a high level. It comes down to matchups during this part of the season and playing to your strengths, something Villanova does well. Seton Hall 20-9 (9-7) The Pirates won a unique game at Providence this past week, playing the game over two days at two venues. Due to unseasonable temperatures out east, condensation formed during the game, postponing play until Thursday morning. Seton Hall has an odd resume to this point in the season, having won three straight games after dropping four consecutive before that. The Pirates close with two home games, playing host to Villanova and Butler. Closing out 10-8 in conference will be deemed a success. Creighton 20-9 (9-7) The Bluejays found life and beat Villanova in overtime for a much needed win. With games against DePaul and Marquette, the Bluejays have an opportunity to steal the 3 seed by going 11-7. Creighton seems like they can go cold, however, and that does not bode well for a team looking to build consistency heading into the conference tournament. Butler 19-10 (9-7) The Bulldogs rank second in both offensive and defensive efficiency according to kenpom. That bodes well heading into March. Butler has shown that they can play well against high level opponents, but then go to the opposite end of the spectrum and look lost against an opponent they should beat. Will Butler win their first Big East tournament game? The Bulldogs have potential to run the table in the conference tournament or lay an egg and go out after their first game. Inconsistency has been the issue for Butler over this season. If they can string together some consistent games, the Bulldogs will be dangerous. Providence 18-11 (9-7) The Friars play Xavier and St. John’s to conclude the season, where they will most likely go 1-1 and finish the conference season at 10-8. The Friars, at this point, are likely in the tournament. A win in the Big East tournament will help. Marquette 16-12 (7-9) The Golden Eagles are highly efficient on offense and essentially choose to not defend. They have the widest gap between offensive and defensive efficiencies according to kenpom. Georgetown 15-12 (5-11) The Hoyas seemed to have figured out a flow and style that work for them. They can be dangerous in the tournament depending on matchups. DePaul 11-17 (4-12) DePaul has shown promise this season and hope to continue to build a program that challenges the top half of the conference in the coming years. St. Johns 14-15 (3-13) The Johnnies surprised me this conference season by starting 0-11, then rattling off 4 consecutive wins including against Duke and at Villanova. They’ve been disappointing, but their identity changed when the injury bug hit them. With their recent burst of winning, will the Red Storm challenge in the conference tournament and steal a game or two? It seems odd to be writing about a Senior Day for Butler on February 20th, but here we are! Today, the Butler Bulldogs host the Creighton Bluejays. Regardless of outcome, the Butler basketball team and fans will be celebrating the successful careers of Tyler Wideman and Kelan Martin. Beginning in his sophomore season, Tyler Wideman has started every game he has played in, playing an instrumental role down in the lane. Listed at 6-8, he has always demonstrated hard work, fighting to put up shots and grab rebounds off the glass. In his senior season, he is averaging 9.6 points and 5.2 rebounds. He recently scored a career high 23 points in a win at Marquette. Although he gives up a few inches, he is always fighting for position and hustling down the floor. It’s been fun watching him grow over the past four seasons. Tyler currently leads the Big East in field goal percentage at 69.9% from the floor. The second senior joining Wideman in playing his last game in Hinkle is 6-6 forward, Kelan Martin. Martin has grown immensely at Butler since he joined the team, especially in the last 2 seasons. His maturity on the court has been critical to Butler’s success. Over his career, he has averaged 14.6 points and 5.2 rebounds per game. During his senior season, Martin has averaged 20.7 points, currently placing him third in the Big East, behind only Shamorie Ponds of St. John’s and Markus Howard of Marquette. In their first outing of Big East play, Creighton dismantled Butler, running out to a 49-32 halftime lead. The game was never seriously in doubt from about 10 minutes into the first half. Creighton moves the ball well and Butler looked lost for a majority of the game. One difference is the Bluejays will be without Martin Krampelj due to a season-ending knee injury. Creighton plays an uptempo offense. According to kenpom, the Bluejays have the eighth shortest length of possession at just over 15 seconds every trip down the floor. Because of this pace, Creighton consistenly touches at least 70 possessions each game, maxing out at 84 possessions on two occasions this season. The Bluejays will look to push the tempo against Butler. Butler has been horrendous in transition defense in the 3-4 games before beating Providence. Even then, the Bulldogs didn’t look great in the first half. The frightening stat from the last time these two teams met that Butler needs to limit are the assists. Creighton assisted on 23 of the 33 made baskets. I spoke of Kelan Martin’s maturity earlier in this write up and he will have to display that this evening. He was lethargic at best, going 5-12 and scoring 10 points with 6 turnovers in the January matchup. Creighton has a system that works when the ball is moving. Butler will need to play strong defensively. According to Haslametrics, Creighton ranks 11th in near-proximity percentage, at 72.23%. I foresee Butler playing a pack defense in the lane forcing Creighton to make shots from 15 feet. If Creighton is on, it will be a rough night for Butler. Butler has come across tentative in driving the ball until the second half of the Providence game. Driving the ball in the lane and going up strong forces the referees to make a decision. If there is help side defense, where a second defender is forced to come over to help stop the person driving the ball, it leaves someone open. Butler will have to be crisp in their passing to get this win. College basketball began conference play furiously with a series of unexpected upsets. Initial favorites in major conferences struggled, but over the course of the month, most of those favorites righted the ship. That didn’t leave statistical outliers hanging though! In fact, we were graced with one of the oddest performances in modern college basketball history – a triple overtime game between the Siena Saints and Saint Peter’s Peacocks which saw Siena win 59-57. At halftime, Saint Peter’s held, what looks like in hindsight, a commanding 26-16 lead. By the end of regulation, the score was tied at 40. 5 points for each team in each of the first two overtimes saw the teams knotted at 50. An explosion of offense saw Siena squeak by. The details in the numbers of this game are even more revealing in how odd this game was. Saint Peter’s was called for 29 fouls compared to Siena’s 18, a difference so large that Saint Peter’s had 3 of their players foul out. Two others players for the Peacocks had 4 fouls. Without looking at the box score, a basketball fan can infer that there was a lot of time spent at the free throw line. And you are correct! Between the two teams, sixty free throws were attempted. Saint Peter’s shot 12-21 (57%) at the charity stripe and Siena was 24-39 (62%). The unfortunate shooting night from the free throw line bled elsewhere on the floor. Both teams hit 5 three-pointers during the 55 minute game. 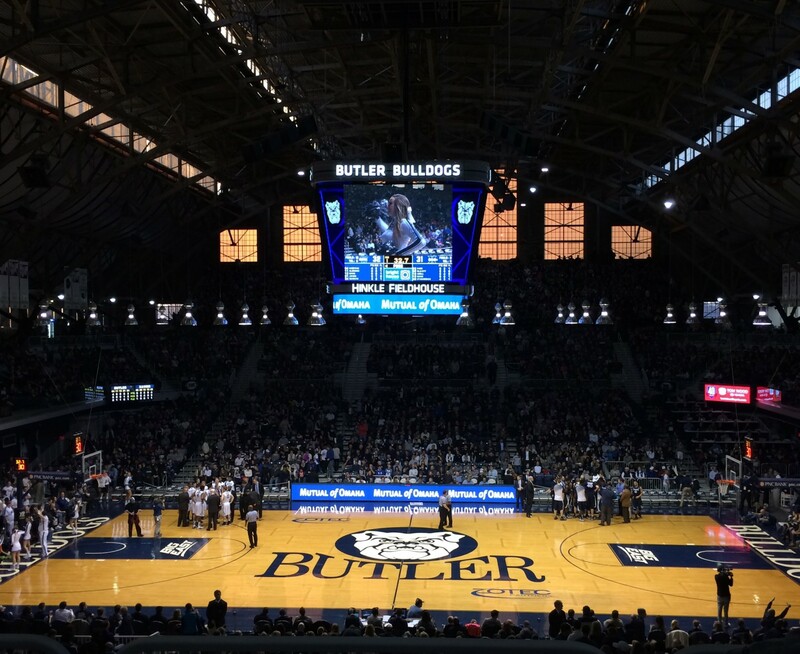 Tonight, the Butler Bulldogs host the Xavier Musketeers in an I-74 rivalry. Over the past 20 years, both teams have seen sustained success in multiple conferences. Once former members of the Midwestern City Conference, the extensive history of these two teams has seen Xavier hold a winning advantage 39 of the 59 times they have played. The consistent meetings of the two teams ended in the mid-1990’s as teams left the MCC for other conferences. Eventually, the MCC rebranded into the Horizon league in 2001. Prior the rebranding, it had been renamed the Midwestern Collegiate Conference in 1985, keeping the same initials. In 2012, Butler joined Xavier in the Atlantic 10 Conference before both teams were brought into the Big East. Since joining the Big East, the Musketeers own an 8-3 record over the Bulldogs. It’s difficult to beat the Bulldogs in Hinkle Fieldhouse. Butler is 12-1 this season with the lone loss coming to a Seton Hall team loaded with experience. In that game, Butler gave up an 11 point lead. Recently, the Bulldogs have seen success on both ends of the floor, bringing both their offensive and defensive efficiency into the top 35 according to Kenpom.com. Xavier, though efficient on offense, struggles in interior defense. That seems odd because Kerem Kanter and Tyrique Jones rebound the ball at a high rate on both the offensive and defensive ends. Look for the Bulldogs to drive the basketball. If the shots begin to fall, playing the inside-out game will be a determiner in the result of this game. Turnovers: Xavier has committed turnovers on 16% of their possessions during Big East play, a number most coaches would like to see lower. The Bulldogs force a turnover on 17% of the possessions that their opponent has the ball on offense. Running the floor: Xavier plays an uptempo game, averaging just over 15 seconds per possession. Butler comparatively takes over 17 seconds per possession. It may seem slight, but a few seconds here and there can change things quickly. How Butler wins tonight: If the Bulldogs expect to win, they will have to continue to get back on defense, make shots in the paint early on, and find a way to allow Paul Jorgensen and Tyler Wideman to contribute. When both of them are able to find ways to score, it’s difficult for opponents to beat Butler. I think Butler wins this in a close finish, 81-78. Random notes: A lot of people that cover college basketball have bumped Xavier up to the 1 seed line as a projection for Selection Sunday. That makes two Big East teams, Villanova being the other, as 1 seeds. Butler visit’s Villanova Saturday for a noon tip-off. After being ranked 42nd in Kenpom just over two weeks ago, the Bulldogs are up to 19th.